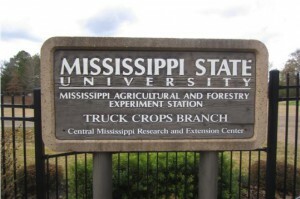 The Truck Crops Branch Experiment Station is located on Highway 51 in Copiah County just south of Crystal Springs. The station was established in 1938 and concentrated mainly on vegetable production. Over the years, as new technology emerged and our understanding of what growers, producers, and home owners wanted out of their plants, we have changed along the way. We have a little over 175 acres of land to work with which makes us the largest horticulture research station in the MSU system. The ornamental research program has or is working on many projects such as a breeding program for new plants in Mississippi, websites to distribute information on performance of plants in our climate, Hydrangea cultivar trials, fertilizer management studies, Crape Myrtle variety trials, substrate ingredient studies, winter production strategies for high tunnels, growth regulator research, season extension technology studies, pot-in-pot planting research, Bio-container trials, and yearly bedding plant cultivar trials, including both a spring and fall annuals trial with over 200 entries each.